Here is a newsflash. The IRS isn’t that bright. But there is a problem. I think they are cooking up a scheme that they think is going to increase tax revenue, but in reality is going to cost all of us more money without benefiting the tax coffers at all. Its long been known that there is a certain contingency at the IRS and within Congress that wants to remove the tax-exception for municipal bonds. I’ve heard it time and time again from various sources. IRS hates munis. Here is their thinking. Municipal bonds are purchased mostly by the rich, who currently pay a 35% marginal tax rate. If there were no tax-exemption for municipals, the rich would be buying some other kind of bond, say a corporate bond, and paying 35% taxes on the income. So from the Federal government’s perspective, they are missing out on 35% in taxes. This 35% is basically a subsidy to state and local governments as well as many non-profits, particularly hospitals and colleges/universities. These issuers enjoy a lower interest rate on bond issues because the rich desire tax-exempt income. Let’s put some numbers on this. According to SIFMA, there are $2,726.8 billion in Municipal bonds outstanding. According to Merrill Lynch’s Master Index, the average muni coupon is 4.69%. The Treasury department seems to think that if there were no tax exemption on munis, the average coupon would be 4.69%/0.65 (0.65 being the inverse of the 35% tax rate), or 7.22%. They would then tax you on the 7.22% coupon, adding up to $69 billion per year in tax revenue. Or so they seem to think. More on this in a moment. Enter the Build America Bonds program. Under this program, municipalities can issue bonds with a taxable interest rate and receive a 35% subsidy on the rate. So for example, one of the first large BAB deal was for the University of Virginia. It sold with a coupon of 6.2% on a $250 million deal. Thus the Federal government will be writing a check to UVA for $5,425,000 every year until this thing matures in 2039. The Treasury department seems to this this is no blood, because UVA was effectively getting a 35% subsidy anyway. Why not just pay them in cash? Ostensibly, the purpose of the BAB program was to open up demand for municipal securities beyond traditional buyers. If you remember back when the BAB program was enacted (February 17) the municipal bond market was in shambles. Demand from retail buyers, either direct or through mutual funds was non-existent. $14 billion had been withdrawn from muni mutual funds during the 4th quarter. The BAB program was supposed to help by enticing non-tax paying buyers, particularly pension funds and foreign banks, to buy muni bonds. That part of the program has worked brilliantly. BABs have become very popular among institutional investors. It has also constricted tax-exempt supply, which is a big part of why municipal bonds are so expensive currently. But is there scum and villainy at play here? Are there those who want to see the BAB program made permanent and the tax-preference for municipals eliminated? Let’s go back to the assumptions made by those who want to see munis die. First there is an assumption that all municipal bond buyers are in the 35% tax bracket. But that is obviously false for a number of reasons. First, only about 1% of filers (or about 1 million returns) pay the maximum rate. Probably not enough to soak up the entire muni market. Its common for wealthy individuals who are no longer actively working to have very little traditional income, thus a relatively low tax rate. In fact, my wealthiest client has been stuck in AMT for several years. Some municipals are held by for-profit corporations, but this is overwhelmingly insurance companies who don’t necessarily pay the maximum rate either. Insurance companies have notoriously variable tax rates, as they go through periods of higher or lower claims. Evidence from trading history also suggests the marginal buyer of munis was at less than the 35% bracket. Here is a chart of the Muni/Treasury ratio since 2001. But even there, the ratio is usually in the mid-upper 70’s. Only during a handful of periods (mostly when corporates got very tight, not when there was any change in tax policy) did that ratio fall into the low 70’s. So I think we can kill the first part of the theory, that the Treasury is suffering 35% in forgone tax revenue. Its probably more like 30%, somewhere between the 35% bracket and the 28% bracket. This is driven home all the more by fact that Build America Bonds are currently making up half of total municipal bond issuance. Currently municipalities can choose whether to sell bonds under BABs or to sell in the traditional tax-exempt market. As it is, almost all bonds issued longer than 15 years are going BABs. Why? Because the interest savings by going to the tax-exempt market is smaller than 35%. So municipalities are taking their 35% from the Feds! Here is the first instance where I’ll say this program is costing tax payers. If we want to subsidize local governments, its cheaper to just allow them to sell tax-exempt debt. Paying this direct subsidy is clearly costing federal tax payers. Now let’s say the conspiracy theorists are right, and the Treasury really wants to extend to BABs program permanently and eliminate the tax-exempt market. We’ve already seen that the 35% subsidy costs the Federal government. What about local governments? We all pay some sort of taxes to both the Feds and the locals. Does it really matter if we pay somewhat more to the Feds and somewhat less to our state/county/city/etc? It does if the municipality also winds up paying more! If there were no municipal bond market, how would retail investors invest in the bond market? As any one who deals with individual investors knows, the answer is they will go where the yield is. Where will the yield be? Not in munis. It will be in corporate bonds, preferred stock, high-yield funds, etc. Who will buy the municipals then? The same people who are buying the BABs! BABs have found ready buyers among those who traditionally had bought high-quality long-term corporate bonds. 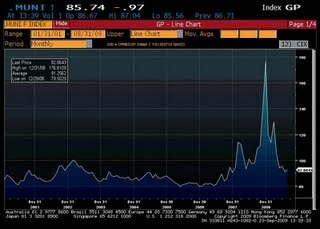 Once upon a time, these were buyers of AAA-rated names like AIG (AIG) and General Electric (GE). Obviously what was once thought of as a very safe, “sleep at night” bond is no longer considered as such. Many of those buyers have moved on to the BABs market, where you feel like you can sleep at night buying the State of Utah or the University of Texas bonds. You also have big mutual funds buying, figuring BABs are a good alternative to Treasuries for their long-term bond exposure. On the surface this seems like no big deal. Municipalities sell the same bonds just to a different set of buyers. What’s the difference? It probably is no different if you are the University of Texas selling $300 million in bonds. Institutional buyers like that they can buy as much size as they want. But what if you are the City of Mos Eisley Speeder Parking Revenue Authority who wants to sell $10 million? Deals of that size happen all the time in tax-exempts. In the classic municipal market that was no problem because munis are often sold $20,000 at a time anyway. Retail buyers don’t care about deal size. They care about name recognition. So the Mos Eisley Parking Authority sells bonds to the rich moisture farmers in the area who feel like they know and understand the parking revenues in Mos Eisley. The big mutual funds, pensions, insurance companies, etc., don’t “know” Mos Eisley. The only way they will bother to take a look at a smaller deal is if it offers much higher yields than similar (larger) deals. And if you are some lower-rated small issuer, like a hospital or private college, forget it. As an institutional buyer myself, if I’m going to really have to dig into a institution’s financials and track it closely from quarter to quarter, like I would a Baa-rated hospital, I better be able to get large size to make it worth my while. So the local hospital who wants to sell $20 million in bonds to build an addition isn’t going to attract institutional buyers at all, virtually at any price. In the traditional tax-exempt market, a strong AA-rated revenue issuer, even if it were a small deal, would classically only be 10-15bps cheap to a state GO. If retail investors were taken out of the muni market and replaced by institutional investors, that gap is probably 50-75bps. Like I said, institutional buyers would have to be paid substantially to buy the small issue. So let’s do the comparison. On 9/16 the State of Utah just sold a 10-year BABs with a spread of 70bps vs. the 10-year Treasury. That came out to a 4.15% coupon. Thus the Federal government will be paying Utah 145bps of subsidy for a “net coupon” to the state of 2.70%. Conveniently, on the same day Utah also sold 9-year tax-exempt bonds at a yield of 2.68%. 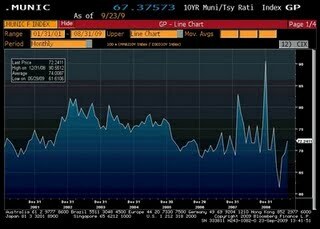 There is about 17bps in spread between 9-year and 10-year munis right now, so we can guess had Utah sold 10-year tax-exempts the yield would have been around 2.85%. 15bps of savings to the state by going with the BABs program. Now let’s take a high quality but small issuer who has to sell bonds 75bps wider than the state of Utah. Had they sold on the same day as Utah they would have had a spread of 145bps for a coupon of 4.90%. The subsidy would be 171bps for a net coupon of 3.18%. So earlier I assumed that same issuer could normally come in the tax-exempt market 15bps wider than Utah, or 3.00%. So if the tax-exemption were taken away and thus retail weren’t around to buy up smaller deals, the smaller issuer would pay 18bps in higher interest that it would otherwise. Now let’s think about the wealth transfer here. Small issuer pays more in interest. Federal government pays small issuer, but not enough to make up for the extra interest cost. Federal tax payers pay more. Local government pays more in aggregate, which of course eventually hits local tax payers. Who wins in all this?